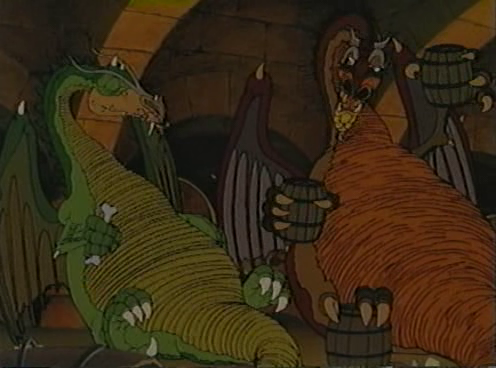 The Flight of Dragons is a magical, and sadly largely forgotten, animation set in a world where science and fantasy live side by side. One without the other would be alarming – can we truly be human if we abandon either? Based on a pseudo-factual book regarding the aviation of mythical creatures, The Flight of Dragons is, for all intents and purposes, a whimsical, fantastical adventure which takes us to a realm populated by knights of valour, fair maidens and unspeakable monsters. Yet, we are asked – why do these make-believe creatures and imaginary lands matter to us? In a world of progress, where secular humanists place the pursuit of logic at the centre of the universe, why should flights of fancy be of any importance? Their very existence is, after all, predicated on lies and a lack of logic. How can anything fundamentally untrue be of use to us as a civilisation? Science, in the world of The Flight of Dragons, is killing magic. Humans have begun to favour logic over the inexplainable; whereas mortals and the enchanted formerly lived side by side, the magic of the world has began to irriversably fade. The Green Wizard, Carolinus (Harry Morgan), summons a meeting with his brothers to discuss how to best protect the world's remaining magic before it becomes entirely extinct. The suggestion to create a Magical Realm, an invisible place where the mythical can exist away from the dangers of science, is agreed by all but one brother - Ommadon (James Earl Jones), the Red Wizard, decides that the best course, instead, would be to use his magic to encourage mortals to advance their machinery to a level which will devastate the earth instead. Ommadon must be stopped, stealing his crown will deplete him of his powers, but, alas, the brothers must not wage war with one another. Carolinus and his siblings agree that volunteers should be sent in their place; Gorbash the dragon and Sir Orrin Neville-Smythe (Bob McFadden), a knight of high esteem, are the two ideal candidates but, to ensure victory, a third protagonist is selected to take part in their quest. Surprisingly, they summon a mortal man named Peter to do their bidding; his normal life, a bookish scientist in the 20th century, seems far removed from the world of magic yet his affinity for the mythical, as seen by a fantastical board game he is developing, hint that he may indeed be a rather wise choice to face-off against Ommadon. Over the course of the film we realise that the two, fantasy and science, are profoundly interlinked – one cannot survive without the other and we, as humans, cannot live without either. True, it was scientific discovery that put planes in the sky but man had to dream of flying first to make it so. Ideas without know how are as useless as widom without imagination. The wonder of The Flight of Dragons also exists in the delightful middle ground where science and fantasy live together – the humbling imaginations of the film's co-creators, Jules Bass and Arthur Rankin Jr, would count for nothing if not for the technical wizardry of the Japanese animators who made dreams come to beautiful life. In many ways, the film acts as a perfect metaphor for how cinema itself works – from George Albert Smith, who imagined viewing moving images in colour and developed the technology to make it so, through to James Cameron's development of 3D to capture his under-water voyages, movies exist in the magic twilight of logic and imagination. The story of science and fantasy living hand in hand is the story of film, it is the story of art, the story of us. Crucially, The Flight of Dragons asks us to examine cold progress without the (necessary) shackles empathy found in magic can inspire in us. It was, after all, unfeeling technological advances which predicated the mass slaughter of millions in the mid-twentieth century. 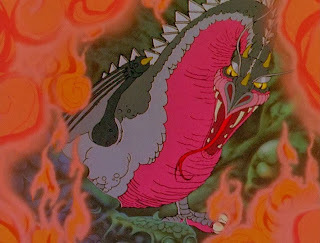 A morose film, helped in no small part by the haunting theme sung with restrained immediacy by Don McLean, The Flight of Dragons is one of the true greats of animation and a feature it is almost impossible to find flaws with. Although slightly dated in appearance, each frame of the film doesn't so much as wear it's heart on it's sleeve; each frame is the beating heart of humans at their greatest, residing at the pinnacle of artistic achievement. The grandiose vocal performances from the entire cast evocate and radiate with emotion too; surely this movie should be textbook requirement for any aspiring actors? Astonishingly, and delightfully, perhaps the most miraculous moment of the film occurs at its conclusion. A beautiful woman appears in front of Peter; he recognises her, he is in heavenly raptures. The magic of romance is alive and, despite everything illogical about the notion of true love, the magic of romance is astonishingly real. Your site has given amazing post.